CAIRO - Egypt's military ruler promised Tuesday to speed up a presidential election to the first half of 2012 and said the armed forces were prepared to hold a referendum on immediately shifting power to civilians -- concessions swiftly rejected by tens of thousands of protesters in Tahrir Square, who chanted, "Leave! Leave!" The latest standoff plunged the country deeper into crisis less than a week before parliamentary elections, the first since the ouster nine months ago of longtime authoritarian leader Hosni Mubarak. CBS News correspondent Elizabeth Palmer reports that the recent demonstration were the biggest gathering of protesters since the initial uprising earlier this year, as about 100,000 people took to the streets against the military rulers. Egypt's military council has little credibility left on the street. It was initially welcomed when it took over in February after President Hosni Mubarak was toppled by mass protests, but almost immediately the generals started maneuvering to hang on to power. That triggered the recent unrest that's so far killed more than two dozen people and injured almost 2,000. In a televised address to the nation, Field Marshal Hussein Tantawi rejected all criticism of the military's handling of the transitional period and sought to cast himself and the generals on the military council he heads as the nation's foremost patriots. Significantly, he made no mention of the throngs of protesters gathered in Tahrir Square to demand that he step down immediately in favor of an interim civilian council. Tantawi spoke as protesters fought army soldiers and police for a fourth day in streets leading to the iconic square that was the birthplace of Egypt's uprising, particularly near the heavily fortified Interior Ministry, which is in charge of police. "Our demands are clear," said Khaled El-Sayed, a protester from the Youth Revolution Coalition and a candidate in the Nov. 28 parliamentary election. "We want the military council to step down and hand over authority to a national salvation government with full authority." The military previously floated the end of next year or early 2013 as the likely dates for the presidential election, which is widely being seen as the last stop in the process of transferring power. But Tantawi did not mention a specific date for the vote or when the military would return to its barracks. Furthermore, his offer for the military to step down immediately if the people so wished in a referendum was vague at best, but it also mirrored the generals' aversion to the youth groups that engineered the 18-day uprising that ousted Mubarak and which are again behind the massive, anti-military protest in Tahrir Square. His referendum proposal suggests that Tantawi has no faith that the crowds in the streets of Cairo and other cities represent of the nation's will. The Muslim Brotherhood, Egypt's strongest and best organized group, is not taking part in the ongoing protests in a move that is widely interpreted to be a reflection of its desire not to do anything that could derail a parliamentary election it is sure to dominate. The Brotherhood and the military have long been suspected of having a secret rapport although both sides vehemently deny it. If a referendum is held, the Brotherhood has the resources to influence the balloting by its ability to mobilize supporters and, for the right price, portray a vote favorable to the military as the duty of Muslims. Belal Fadl, a prominent columnist who has grown increasingly critical of the military after initially supporting it, said the solution for Egypt is to hold a presidential election immediately. "The referendum proposed by the field marshal would have worked if there was no revolution, and no hundreds of thousands in the streets, and tens of dead and thousands of wounded. Fear God for the sake of Egypt," he wrote on his Twitter account. "I had hoped Tantawi's speech would be reconciliatory and consensual. But he chose a defiant speech." Tantawi's address also bore a striking resemblance to Mubarak's televised speeches during the uprising, when the ousted leader made one concession after another -- only to be rejected by protesters as too little, too late. Mubarak said he made many sacrifices for Egypt, that he never cherished power and that he was hurt by the criticism from demonstrators. On Tuesday, Tantawi rejected what he called attempts to taint the reputation of the armed forces. "We have no aspiration to rule. ... The armed forces reject totally these attempts that target the military," a grim-looking Tantawi said. The former defense minister under Mubarak said the criticism of the military council was meant to weaken the armed forces and "bring down the Egyptian state." "The armed forces, represented by the Supreme Council of the Armed Forces, has no desire to rule and puts the country's interests above all," he said. "It is ready to hand over responsibility immediately and return to its original duty of defending the country if the people want that, and through a public referendum if it is necessary." Repeating a charge often made by fellow generals on the military council, Tantawi accused "forces working in the dark" of inciting sedition and driving a wedge between the people and the armed forces. As with Mubarak, Tantawi's words fell on deaf ears in Tahrir Square. "We are getting deja vu of Mubarak. It was a terrible speech and it means nothing. We aren't leaving until the military council steps down," said protester Nevine Abu Gheit, 29. Referring to Tantawi, the crowd chanted: "We are not leaving. He leaves." "The people want to bring down the field marshal," they shouted in scenes starkly familiar to the days in January and February that led to Mubarak's ouster. "What does he exactly mean by a referendum?" asked one protester, 50-year-old lawyer Hossam Mohsen. "We have already held a referendum by being here in the square. Egypt is right here." As Tantawi spoke, protesters and police continued their street battles in the longest uninterrupted spate of violence since the uprising. Tantawi said he and the military council regretted the loss of life, but he fell short of offering an apology for the part the army and the police played in the clashes. Rights groups said the excessive use of force by the security forces was responsible for the high number of dead and wounded. "We condemn the excessive force used by police," U.S. State Department spokeswoman Victoria Nuland said in Washington. "We strongly urge the Egyptian government to exercise maximum restraint, discipline its forces and protect the universal rights of all Egyptians to peacefully express themselves." The massive crowd in the square did not begin to thin out until late Tuesday night. Unlike similar gatherings in January, there were no podiums or speakers but rather a large number of people chanting slogans and milling around the massive plaza waving Egypt's red, white and black flag. A stuffed military uniform was hung from a central light pole with a cardboard sign on its neck saying "Execute the field marshal." People cheered when the effigy went up and state TV showed some hitting it with sticks. The protesters formed a corridor in the middle of the crowds with a human chain, allowing easy access to motorcycles and ambulances ferrying the wounded to several nearby field hospitals. The latest unrest began Saturday when security forces violently evicted a few hundred protesters who had camped in Tahrir. The perceived use of excessive force angered activists, who began to flock to the scene. A joint army and police attempt to clear the square failed Sunday evening, leaving protesters more determined to dig in. The clashes played out amid charges that the military was trying to cling to power even after the election of new parliament and president. The military recently proposed that a "guardianship" role for itself be enshrined in the next constitution and that it would enjoy immunity from any civilian oversight. Further confusing the political situation, the military-backed civilian government on Monday submitted a mass resignation in response to the turmoil. Tantawi said he has accepted the resignation. The political uncertainty and prospect of continued violence dealt a punishing blow to an already battered economy. Egypt's benchmark index plunged more than 5 percent, the third straight day of declines. Banks closed early and many workplaces sent employees home early for fear of deteriorating security. A youth group that played a key role in the anti-Mubarak uprising said it decided to stay in the square until the military handed over power to a civilian presidential council. The April 6 group said that besides a representative of the military, the council should include pro-reform leader and Nobel Peace laureate Mohamed ElBaradei. "The military council has failed to manage the transitional period, and the generals' hands are tainted by the blood of the nation's youth and have been collaborating with the counterrevolution," the group said in a statement. Aboul-Ela Madi and Mohammed Selim el-Awa, two politicians who attended a five-hour crisis meeting Tuesday with the military rulers, said the generals wanted to hand over power to a civilian government by July 1 and intended to replace Prime Minister Essam Sharaf's civilian Cabinet with a "national salvation" government. He and el-Awa were among 12 political party representatives and presidential hopefuls who met with the council. However, none of the youthful, liberal groups behind the uprising attended. ElBaradei also was absent. Madi and el-Awa also said the military agreed to release all protesters detained since Saturday and to put on trial any police and army officers responsible for the deaths of demonstrators. The Interior Ministry said protesters were continuing to try to storm its headquarters. It said some protesters climbed over buildings near the ministry and lobbed firebombs into the compound. Others, it said, set fire to cars outside the ministry and opened fire on policemen, wounding five. The ministry denied allegations that police were using live ammunition against the protesters. In the northern Mediterranean port city of Alexandria, thousands of protesters fought intense battles with security forces, who fired tear gas and rubber bullets. The protesters hurled stones and firebombs. In Assiut in the south, armed men attacked a police station and took weapons and ammunition. Thousands of demonstrators clashed with security forces. 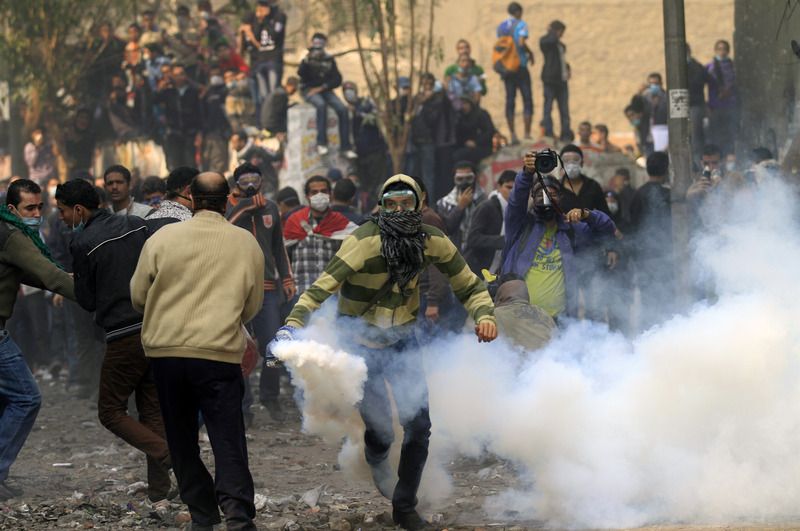 Protesters hurled stones and firebombs at the security forces, who responded with tear gas that caused several people to collapse.